Even though typical Dutch food is not very famous worldwide, I can assure you that you can find delicious bites in the Netherlands! Most of them are snacks or sweets, so perfect to grab between one attraction and another. When I go somewhere new, I always make sure I google their typical dishes to try there. Honestly, besides travel and food, what could be better than a combination of both? Exactly, not many things. 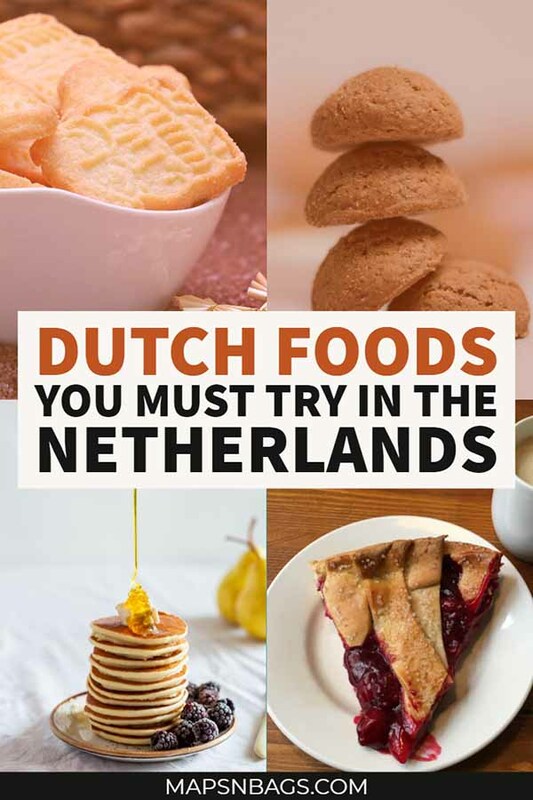 I’ve listed below the top 30 traditional Dutch foods and have indicated the best places where you can find them. Note that most of the places here mentioned are in Amsterdam, but not all of them. But don’t worry, I’ve included their address. So, grab your bite and read further to know more about what Dutch people eat. Dutch Apple Pie is a very traditional Dutch recipe and it dates back to the Middle Ages. 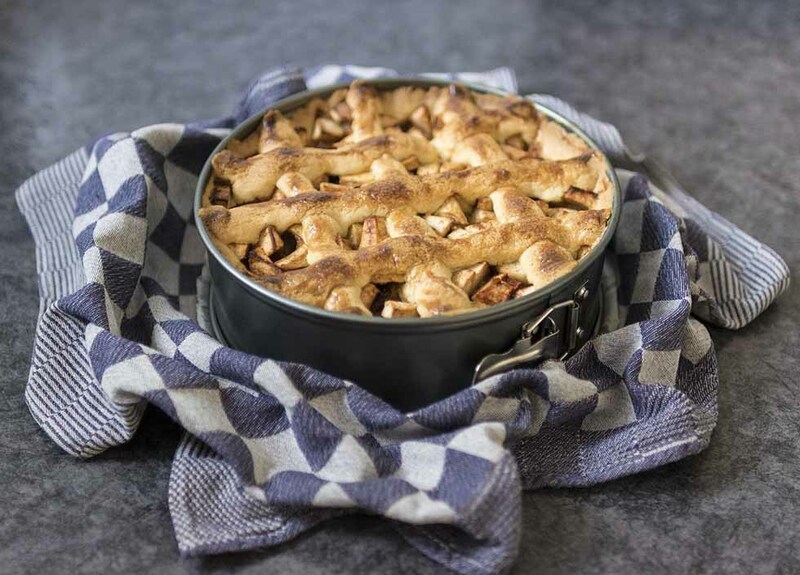 A simple recipe for apple pie was found in a 1.514 cookbook. There are two sorts of Apple Pie in the Netherlands: one with a lattice crust and one with butter crumbs on top (appelkruimeltaart). The difference between these two is the texture: one is crunchier than the other. Bakers usually add several spices to the pie, such as cinnamon and powdered sugar. Don’t know why, but apple pie always makes me think of Christmas. Where can you find the Dutch Apple Pie? At Winkel 43 (Noordermarkt 43, 1015 NA) in Amsterdam. You either hate it, or you love it. As a Dutchman, I love it, but I have met quite some people from abroad who strongly disagree with me. Once I bought a pack of drop for my Brazilian family in law, but I ended up eating it all by myself because they did not like it. 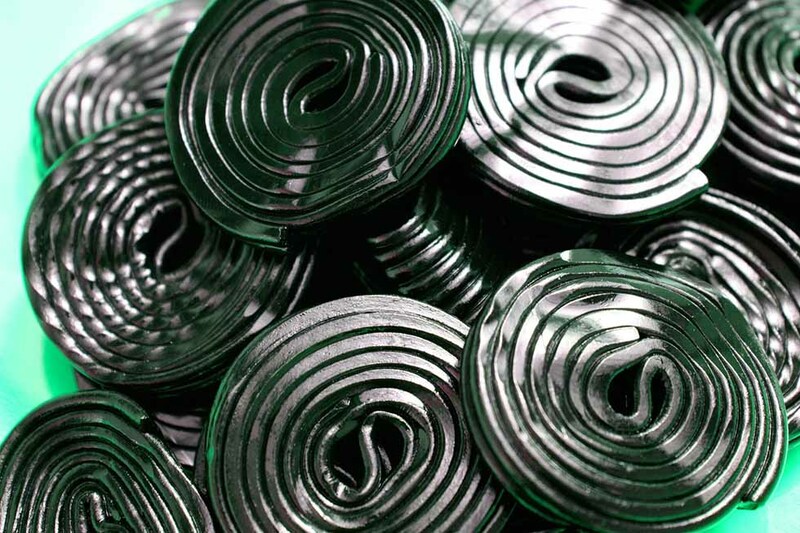 The drop is usually flavored with the extract of the roots of the licorice plant, and in the Netherlands, there are lots of variations of it. Hard, soft, sweet, salty, extra salty. You name it; we’ve got it. Curious about the infamous drop? Where can you find Drop? In every supermarket in the country, but there is an old-fashioned candy store in Den Bosch worth stopping by. It’s called Candy Story Snoeperij Tum Tum (Ridderstraat 11, 5211 JZ). The Netherlands is famous for being one of the biggest exporters of cheese in the world. So, don’t miss the opportunity to eat their delicious kinds of cheese in the country! 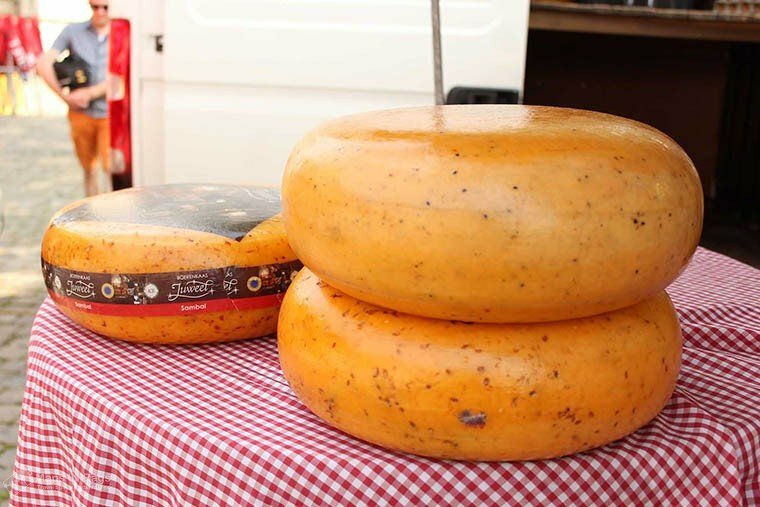 There are different sorts of Dutch Cheese such as Gouda, Maasdam, Edam, and Leyden. Where can you find the Dutch Cheese? At a real cheese market in Alkmaar (open only from March through September one or two days a week) or at De Kaasmaker (Runstraat 7, 1016 GJ) in Amsterdam. In the Netherlands, cold weather is an invitation to stamppot. 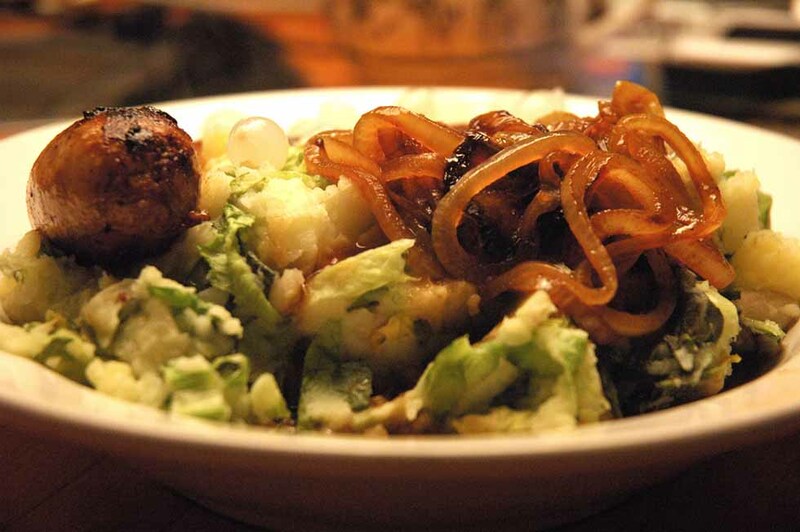 This typical Dutch dish is made from mashed potatoes with kale and sausage. There are of course many variations of it, such as sauerkraut, endive, and spinach. But stamppot with kale is by far the most traditional one. Where can you find Stamppot? At the Moeders Restaurant (Rozengracht 251, 1016 SX) in the Jordaan neighborhood in Amsterdam. This Dutch pancake is larger and thinner than the American pancake. 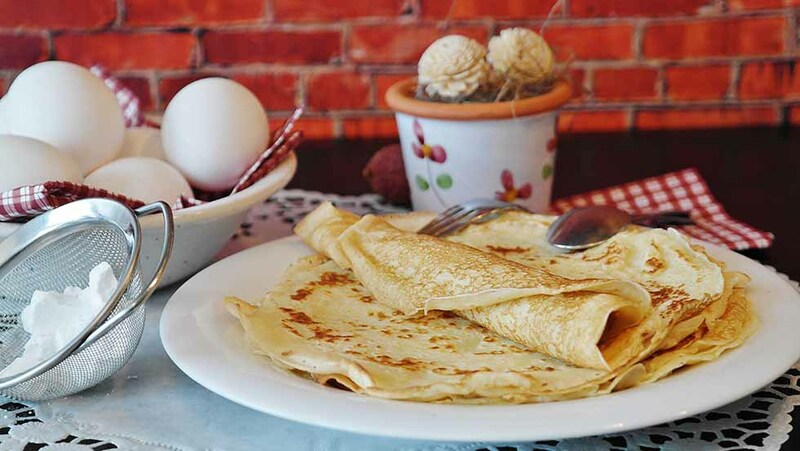 Also, instead of eating it for breakfast, Dutch people usually eat Pannenkoeken for dinner, and it can come savory, with bacon or cheese, or sweet, with powdered sugar or syrup. There are many restaurants throughout Amsterdam (and in other cities too) where you can eat it. Where can you find Pannenkoeken? At the Pannenkoeken Boat (Ms. van Riemsdijkweg 33, 1033 RD) in Amsterdam. The boat is near the NDSM, and I recommend you make a reservation. Hutspot is a kind of stamppot, and it is a typical winter dish in the Netherlands. Winters here can be pretty cold, but this dish will warm you up! It’s simple to make, and it’ll easily satisfy your hunger. 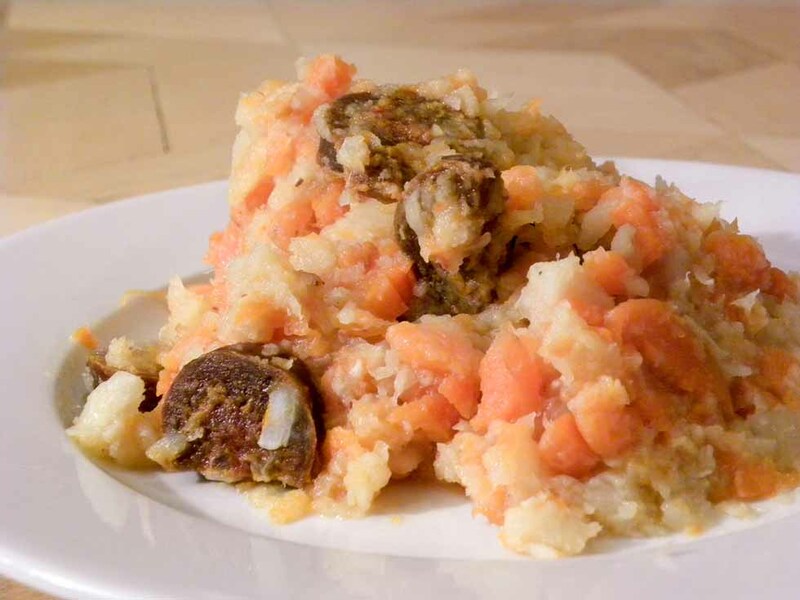 It consists of potatoes, carrots, and onions which are boiled together in a big pan, and are mashed afterward. It can be flavored with salt and pepper. Pretty simple, but tasty! It is traditionally eaten with smoked bacon, meatball or a delicious piece of beef. Where can you eat hutspot? At Haesje Claes Restaurant (Spuistraat 275, 1012 VR) in Amsterdam. They serve hutspot all year long, but I promise you it’ll taste twice as good when it’s freezing outside. 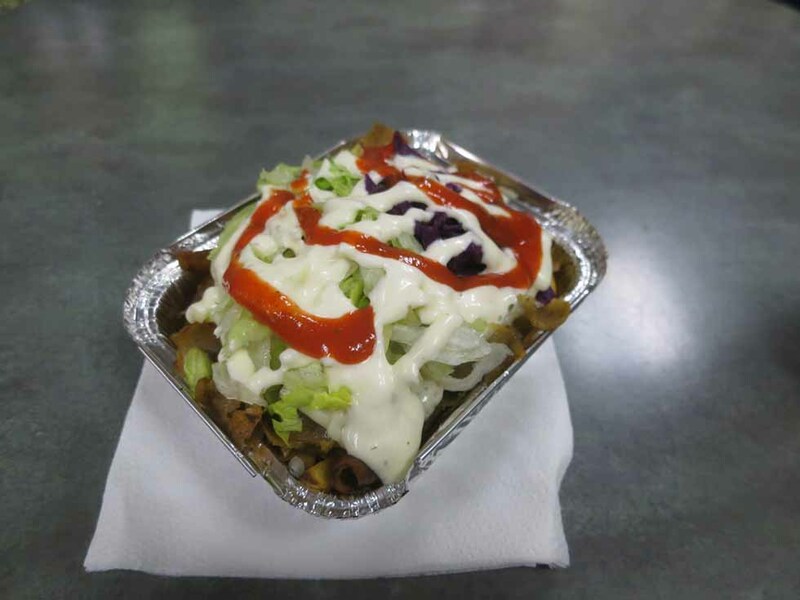 Kapsalon is a mouth-watering mixture of a few delicious foods. It consists of a layer of fries, followed by a layer of kebab or shawarma, melted cheese, and some vegetables and is usually served with garlic sauce. In 2003, a barber from Rotterdam had a local snack bar compose this dish because it contains his favorite ingredients. Because he regularly ordered it, he gave it a name: kapsalon. This is the Dutch word for ‘barbershop.’ The kapsalon didn’t remain unnoticed, and in no time it became a popular dish. Where can you find Kapsalon? At Dönerland Eethuis (Kinkerstraat 312HS, 1053 GD) in Amsterdam or countless kebab shops throughout the Netherlands. Erwtensoep is very thick pea soup, which the Dutch call ‘snert.’ It is usually eaten in the winter because it makes you nice and warm. The main ingredients are peas and potatoes and may also contain cabbage, leek, carrot, and onion. There are a few variations of ‘snert’: it can be eaten with rookworst (sausage) or bread and bacon. All these ingredients make it a savory dish which gives you enough energy to fight the cold. Lots of Dutch families, including mine when I was a kid, eat pancakes as a dessert after the soup. Where can you eat erwtensoep? At The Pantry (Leidsekruisstraat 21, 1017 RE) in Amsterdam. Boerenkool met rookworst also is a typical Dutch winter dish. It is kale mashed together with potatoes and diced bacon. 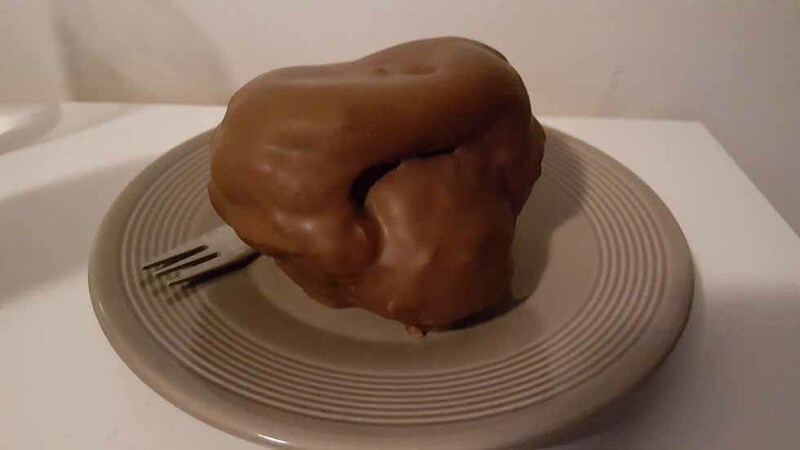 The traditional way of eating this delicious meal is by making a small hole in the middle and poring some gravy in there. On the side, people usually eat rookworst. This is a sausage in which ground meat is mixed with spices and salt, and stuffed into a casing. Boerenkool can be found throughout the country, and some regions have their own name for it. Where I am from, we call it ‘boeremoos’. Where can you eat boerenkool met rookworst? At the Restaurant De Blauwe Hollander (Leidsekruisstraat 28, 1017 RJ) in Amsterdam. Dutch fries (patat, frietjes) are one of the most common Dutch snacks you will find in the Netherlands. Instead of ketchup, Dutch people prefer to it with mayonnaise (and sometimes with onions too!). Other common sauces in the country: peanut and curry ketchup. 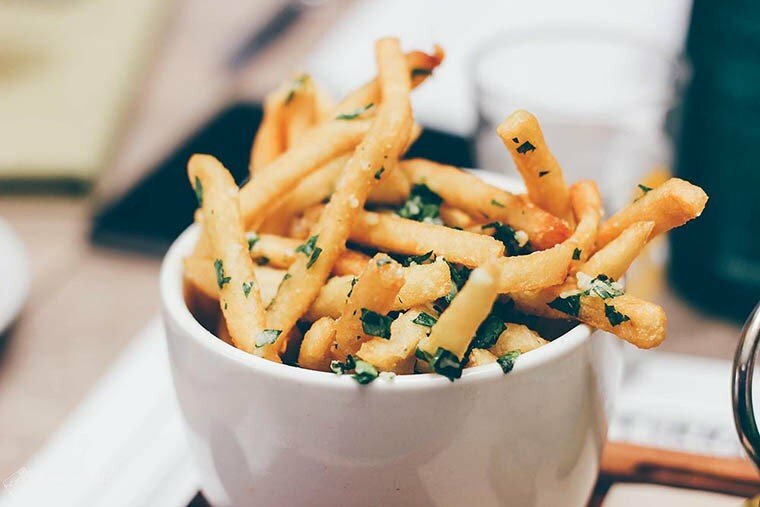 Where can you find Dutch Fries? At Vlaams Friteshuis Vleminckx (Voetboogstraat 33, 1012 XK) in Amsterdam or any snack bars throughout the Netherlands. Worstenbroodjes originated in the province of Noord-Brabant, in the south of the Netherlands. 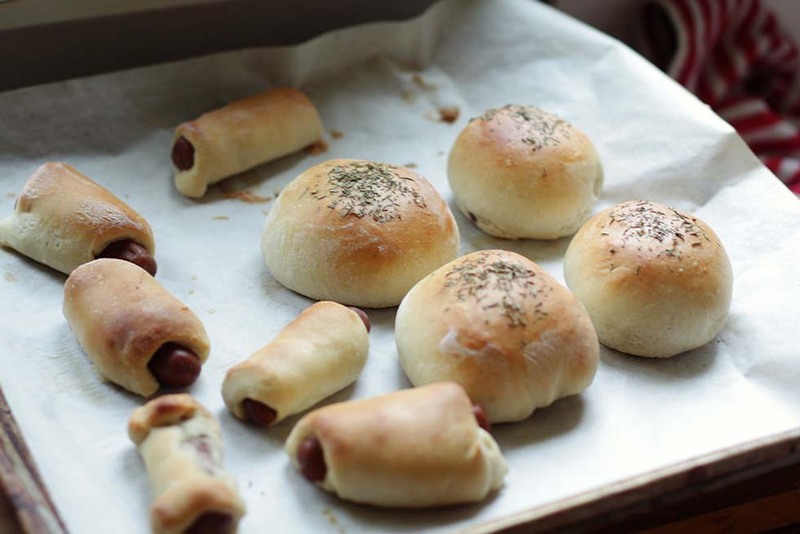 The outside is made of a soft type of dough, and on the inside, you’ll find a beef sausage. This savory snack tastes best when it’s still warm. Fun fact: Back in the days, people were trying several ways to keep the meat from spoiling. One of these ways was to roll it in the dough…and the worstenbroodje was born! Where can you find Worstenbroodjes? At the Banketbakkerij Lanskroon (Singel 385, 1012 WL) in Amsterdam. You can also buy worstenbroodjes at most supermarkets, but they don’t taste as good as at a bakery, of course! 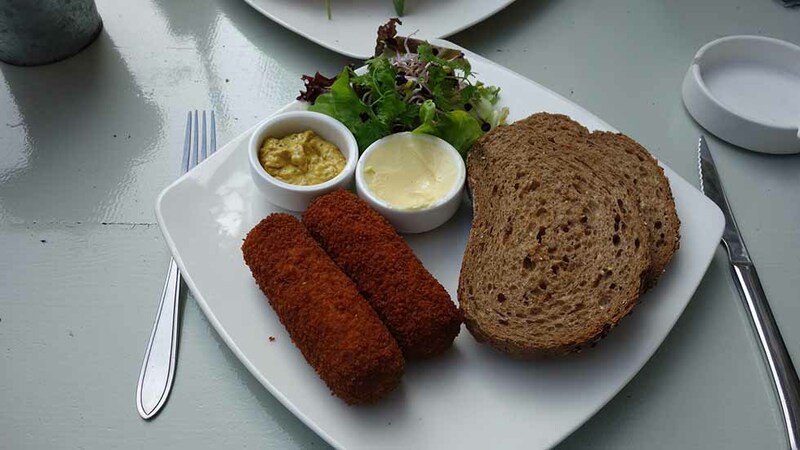 A Kroket is one of the many snacks Dutch people love to eat with their fries. It consists of a crunchy layer of dough and bread crumbs and usually filled with a beef ragout. There are numerous delicious variations of the kroket, where the beef is replaced by another ingredient. Think of goulash, potato, chicken, shrimp and of course cheese. It’s Dutch after all ;). 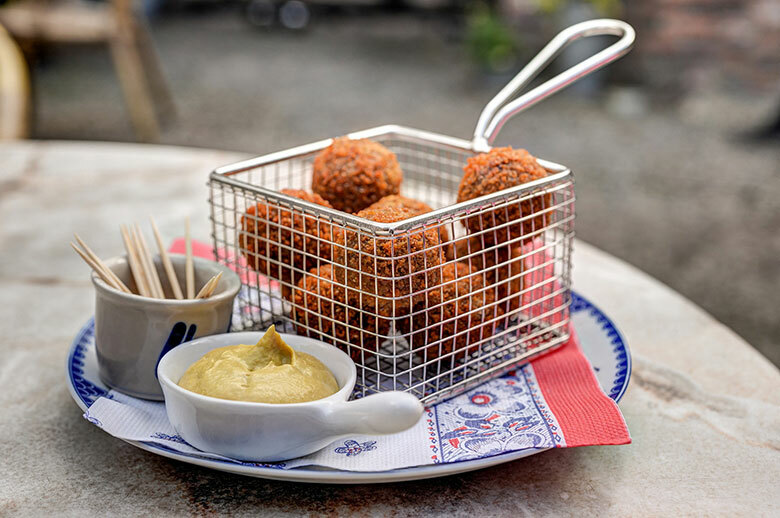 Regardless of the stuffing of your kroket, dipping it in mustard is a blessing for your taste buds! Tip from a Dutchman: Be careful when eating one, the ragout on the inside can be extremely hot! Where can you find Kroket? There are many fast-food stores around Amsterdam with automats. These stores are called Febo. You buy your snack in the automats on the wall and grab your bite, like a toy. But you can also find it at every snack bar in the country. 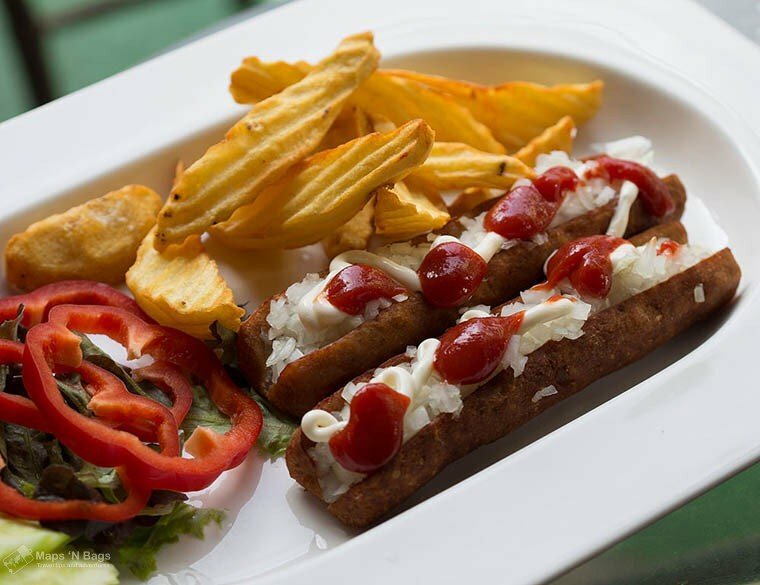 Fun fact: The Frikandel used to be round like a meatball, but because of a change of the Dutch food laws, they had to change it. Instead of changing the recipe, they only changed the shape! 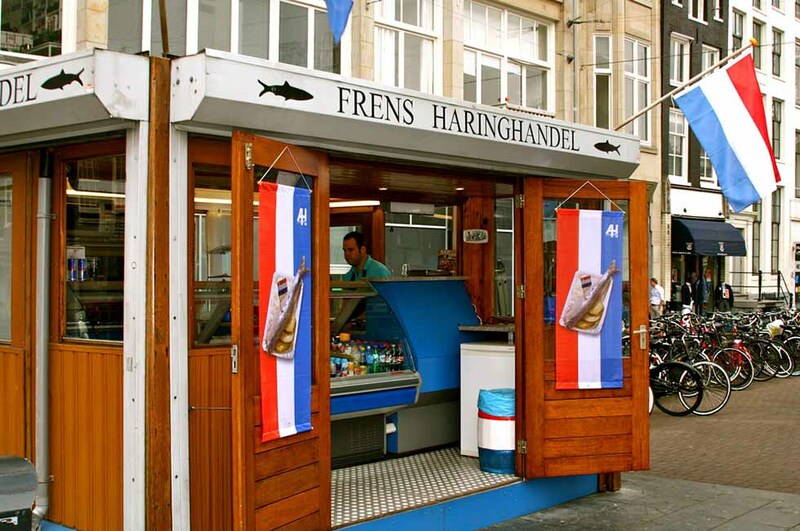 Where can you find Frikandel? There are many fast-food stores around Amsterdam with automats. These stores are called Febo. You buy your snack in the automats on the wall and grab your bite, like a toy. But you can also find it at every snack bar in the country. Bitterballen are very similar to the kroket; only the shape is different. Where the kroket is narrow and long, bitterballen are small and round. This makes them the #1 party snack, and they are often served in a big bowl with some mustard on the side. Besides mustard, they also go exceptionally well with some beers. Hot tip (pun intended): Bitterballen can be very hot, so don’t put a whole ball in your mouth. I didn’t mean to sound pornographic here though. Bite it first to open the snack so the hot air can get out. Where can you find Bitterballen? They can be bought at every snack bar in the country, but also in most cafes and bars. But there’s a special place in Amsterdam to try them, De Ballenbar (Hannie Dankbaarpassage 14, 1053 AS). There you can find different variations of this delicious snack. An excellent way to experiment with Dutch cuisine! Back in the 17th century, the Dutch would import lots of oxen from Denmark and Germany. Butchers used the ox-meat to make ‘ossenworst,’ which means Oxen Sausage. The sausage was brought to taste with several spices, such as pepper and nutmeg. Nowadays, this delicious sausage is no longer made of ox-meat, but of beef and it is traditionally served with ‘Amsterdamse uitjes’ (small yellow onions) or pickles. Where can you find Ossenworst? At Frank’s Smokehouse (Oostenburgervoorstraat 1, 1018 MN) in Amsterdam. Kibbeling is a delicious snack which is usually made of whitefish (or cod, pollock, tilapia, and many others), cut into small pieces. These pieces are dipped in a mixture of flour, egg, beer, and spices, and are then fried. Kibbeling is served with a flavorsome sauce, either remoulade or ravigote sauce. I like both and most people just call it Kibbelingsaus. I am from the south of the Netherlands, where you won’t find this dish so often. 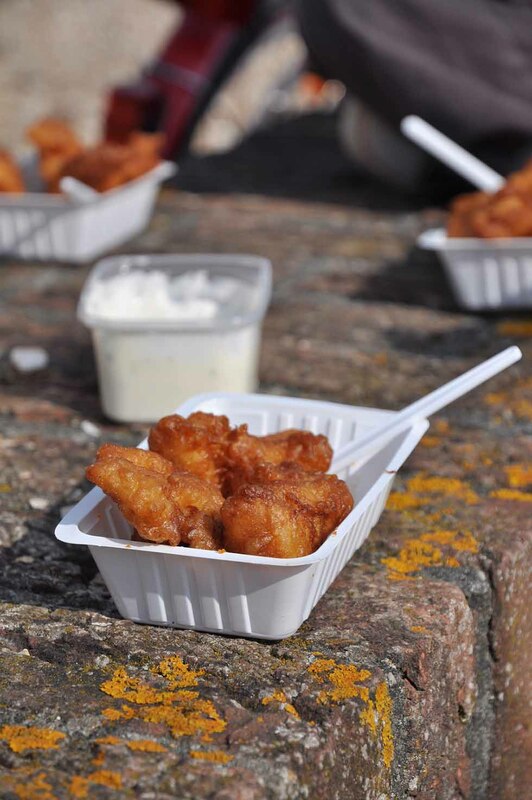 When I think of kibbeling, I always think of the coastal province of Zeeland and of course Amsterdam. Where can you find Kibbeling? At Paviljoen Smit Bokkum (Slobbeland 19, 1131 AA) in Volendam, an easy day trip from Amsterdam. Another fried snack. The Dutch sure like frying stuff! Bamiblok and bamischijf are the same; only the shape is different. A ‘blok’ is rectangular, and a ‘schijf’ is round. As the name might suggest, the inside contains ‘bami,’ an Asian dish. This is most likely a result of the Indonesian influence in the Dutch cuisine. The outside, once again, is made of dough and breadcrumbs. In my opinion, a bamiblok with ketchup is very tasty when served with some fries. Yep. Another snack. The idea of the nasischijf is the same as the bamiblok above. Let’s take an Asian dish, wrap it in dough and bread crumbs, and fry it. This also originates from the Indonesian influences in the Netherlands. Below the crunchy outside layer, there is a savory stuffing made of nasi which can be slightly spicy. Just like the bamiblok, ketchup and the nasischijf make a happy marriage. Where can you find Bamiblok and Nasischrijf? They can be bought at every snack bar in the country. The Dutch have been dealing with water for centuries now. So, it makes sense that one of their most famous snacks is fish. The traditional herring is served raw with chopped onions and gherkins. This is very “lekker,” the Dutch word for tasty. I know fresh fish doesn’t look that appealing, but herring is delicious. Trust me! Where can you find Raw Herring? At many fish stalls in city centers throughout the country. In Amsterdam, look for the Vishandel in the Albert Cuyp street market (Albert Cuypsdtraat 155 1073 BC). Vlaai is a sweet pie consisting of a pastry and filling. This tantalizing treat is called Limburgse vlaai because it’s only found in the Province of Limburg. However, it originally comes from Germany, and since its proximity, you can find vlaai in both Limburg and some regions in Belgium. There are all sorts of flavors: rijstevlaai (rice pudding), kruimelvlaai (crumbed butter and custard pudding), kersenvlaai (cherry), and many others. Dutch people usually eat vlaai on birthdays or in celebrations. But remember, only in Limburg. Where can you find the Limburgse Vlaai? In a 14th-century bakery in Maastricht called Bisschopsmolen (Stenenbrug 3, 6211 HP). Imagine a pastry ball filled with whipped cream and covered with a hard layer of dark chocolate. The mouthwatering Bossche Bol has this name because it comes from Den Bosch, a city in the Province of North Brabant. The pastry that gave the Bossche Bol life was first made in the 20th-century and was filled with custard. Years later, another baker made a few changes to the recipe, and today we have this goddess pastry. Yes, this article will get you hungry. Hot tip: Eat it upside-down to avoid squirting out the filling as the bottom doesn’t have the icy chocolate layer. Where can you find the Bossche Bol? At Jan de Groot Bakery (Stationsweg 24, 5211 TW) in Den Bosch (‘s-Hertogenbosch). 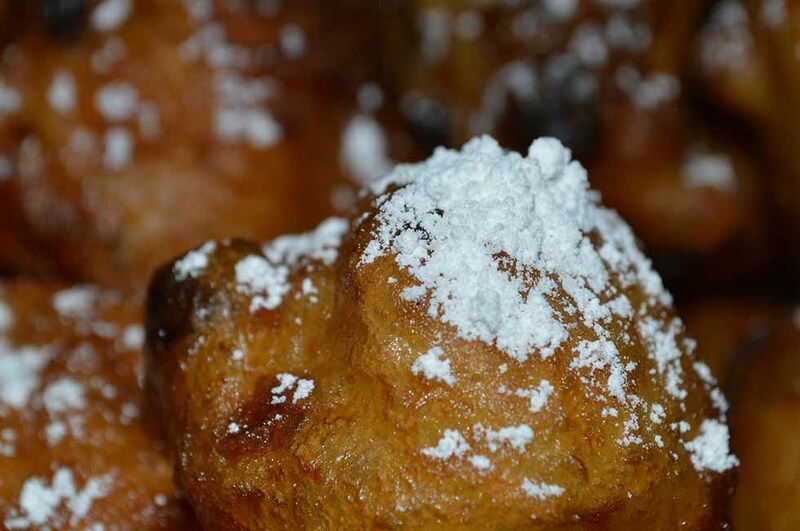 This delicious Dutch Christmas food is fried dough balls and sprinkled with powdered sugar. There can be variations of it, such as the addition of chopped apples and raisins. However, the original one is only dough and powdered sugar. As a tradition, Dutch people usually eat oliebollen on New Year’s Eve, but my family also eats it during Christmas, and you can find stands selling it in the cities the whole winter. Where can you find Oliebollen? At the Banketbakkerij Lanskroon (Singel 385, 1012 WL) in Amsterdam. Oliebollen for a Dutch New Year’s Eve. The name of this treat means ‘biscuit with little mice.’ Dutch parents usually give this treat when their babies are born. It’s a round piece of toast with butter and aniseeds with a sugared and colored outer layer. This layer can be colored either in blue or pink, which is determined by the baby’s gender. Where can you find Muisjes? In every supermarket. 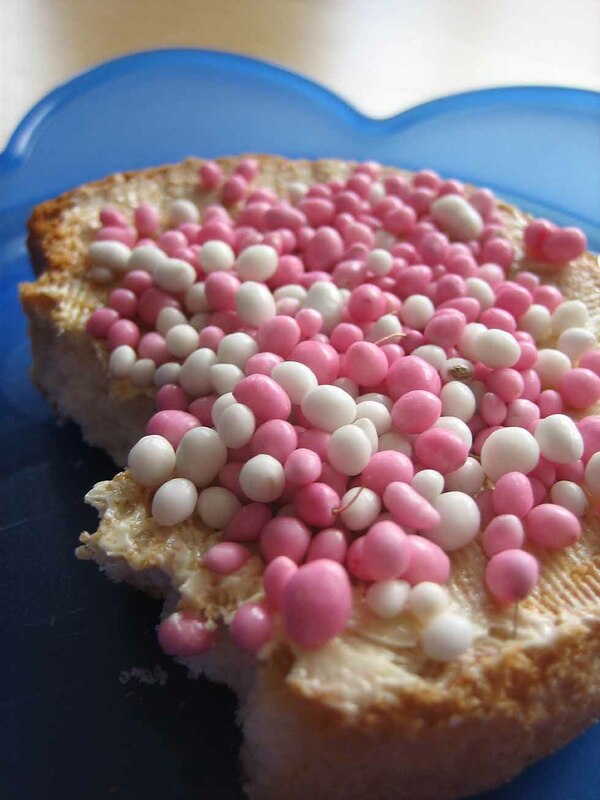 Look for the sprinkles and buy some bread and butter to taste this very traditional Dutch food. Children’s favorite treat (also true for some adults too), kruidnoot and pepernoot are Dutch cookies served during the Saint Nicholas holiday (Sinterklaas). Kruidnoten are crispy spiced biscuits, slightly harder and darker than pepernoten. Its main ingredients are the nearly the same as the speculaas cookies: white pepper, cardamom, cloves, cinnamon, ginger, and nutmeg. 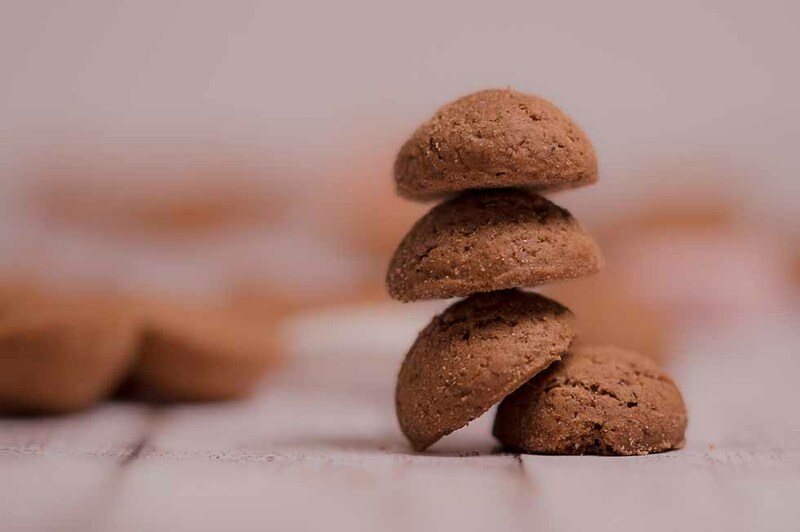 While pepernoten‘s main ingredients are aniseed, cinnamon, and cloves. Where can you find kruidnoten and pepernoten? Sinterklaas is celebrated on Dec 5th and 6th, so around October, you can already find packs of it in the supermarkets. This treat was first made in Gouda in the 18th-century. And today these stuffed waffles are very popular among tourists (and locals) because it’s utterly delicious! Stroopwafels are two thin layers of baked dough filled with caramel syrup… You can imagine why people are crazy about it, right? 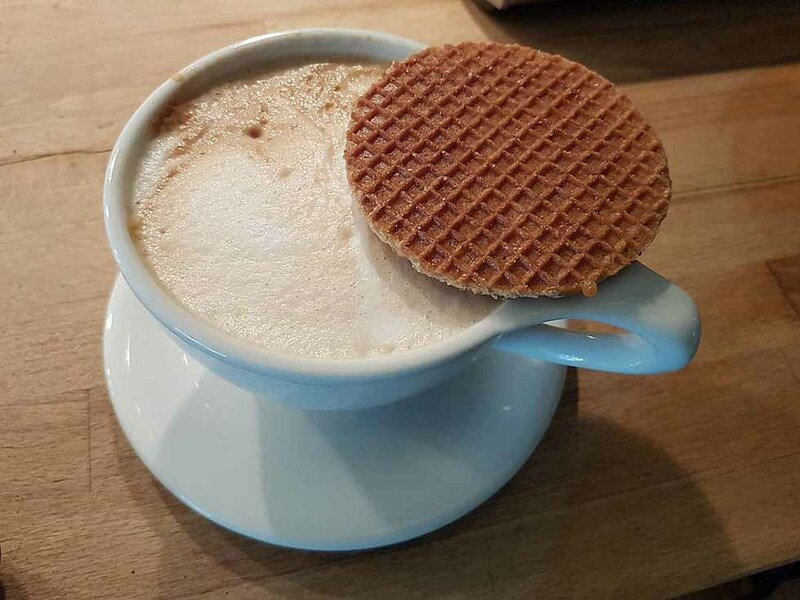 Where can you find Stroopwafel? Since it was invented in Gouda, go to the city to try freshly made Dutch waffles. Look for the Kamphuisen Siroopwafelfabriek (Markt 69, 2801 JM). A small, but sweet place (pun intended). 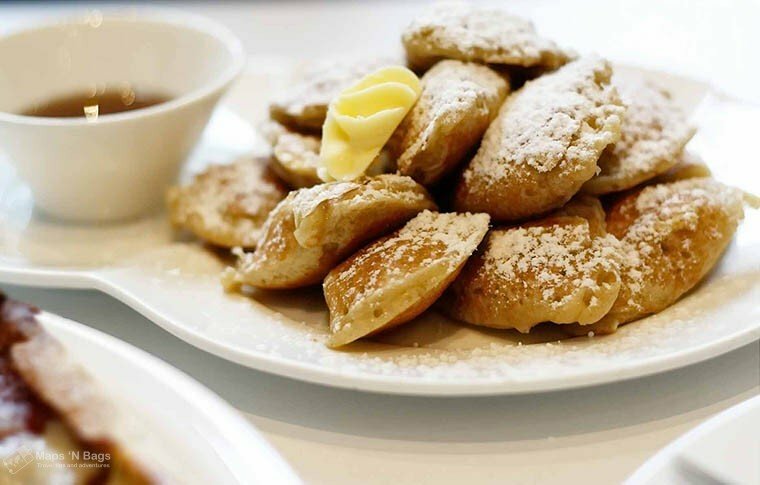 Poffertjes are tiny fluffy pancakes served with powdered sugar and butter. Mouthwatering for sure. You can eat these traditional Dutch treats all year long, but they’re more popular during winter and in Christmas Markets. Where can you find Poffertjes? At some stalls throughout the city centers during winter time or at De Vier Pilaren (Stadhouderskade 11, 1054 ES) in Amsterdam. Hagelslag is the traditional chocolate sprinkles. The ones you find on donuts, for example. But the thing here is that we, Dutch people, eat it on bread for breakfast, for example. There are all kinds of varieties: pure chocolate, white chocolate, milk chocolate, and a mix of them all in one pack. Where can you find Hagelslag? At Hagelswag (Heisteeg 8, 1012 WC) in Amsterdam. Speculaas cookie is a crunchy spiced biscuit which has figures on it from Sinterklaas stories. Some say this is the reason it’s called speculaas which means mirror in Latin. 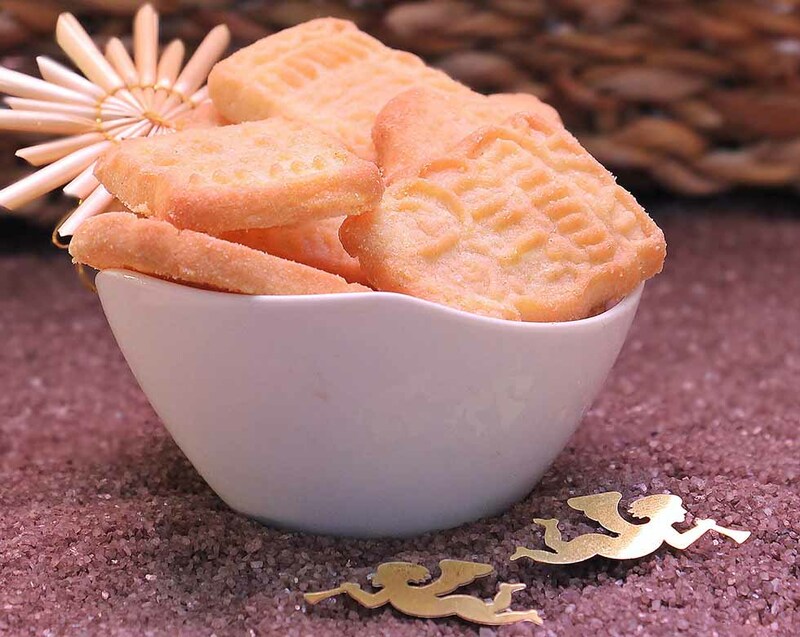 It brings out the flavor of Christmas: warm spices in sweet cookies. Its main ingredients are white pepper, cinnamon, ginger, cloves, cardamom, and nutmeg. Hot tip: Dip it in coffee and thank me later. Where can you find speculaas cookies? This cookie was first made for this time of the year, but you can find it all year long in supermarkets. This creamy spread with caramelized granular looks a lot like peanut butter. However, this spread is a variation of the cookie I mentioned above. And just as the cookies, it is delicious when served with coffee. Where can you find speculaas cookies spread? In every supermarket throughout the Netherlands. 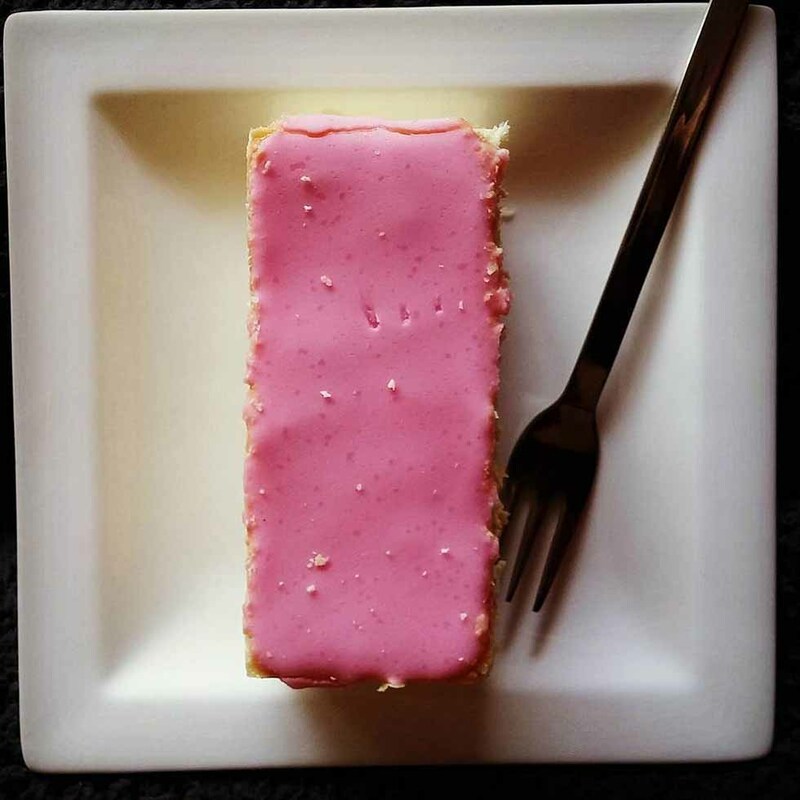 Tompouce is a rectangular pastry filled with whipped cream and covered with a thin layer of pink icing. However, pink turns into orange around King’s Day as this is the Dutch Royal Family’s color. Dutch people usually eat it on birthdays or celebrations. 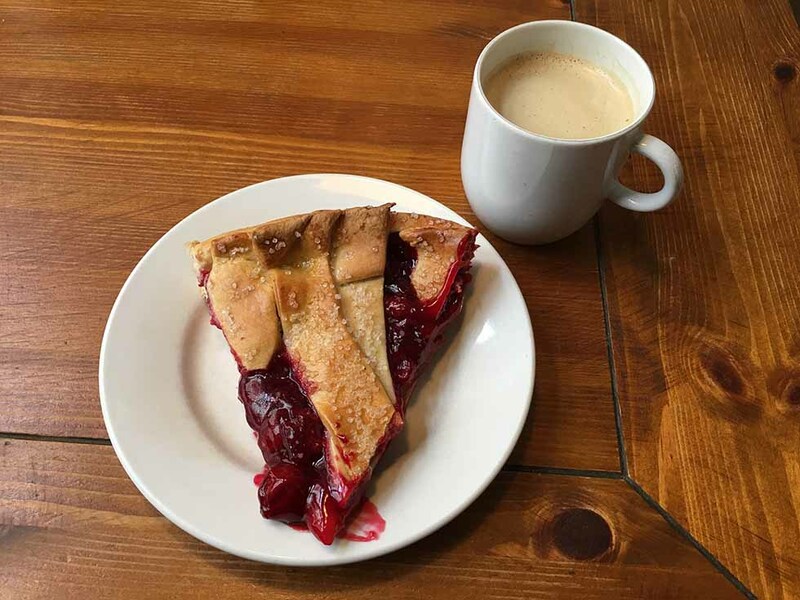 Fun fact: This pastry’s name was inspired by the French translation of Tom Thumb, a character of the English folklore. Where can you find tompouce? At Patisserie Holtkamp (Vijzelgracht 15, 1017 HM) in Amsterdam. The Netherlands is not only very charming and exciting, but it also has many delicious bites for foodies like you and me. I hope you can taste most of these foods, if not all of them during your trip to the tulip’s country! And when you do, please, come back here and let me know what you think about them, especially about drop! Would you add something to this list? If so, what then? Did you like this post? Then pin this post to your Pinterest board! 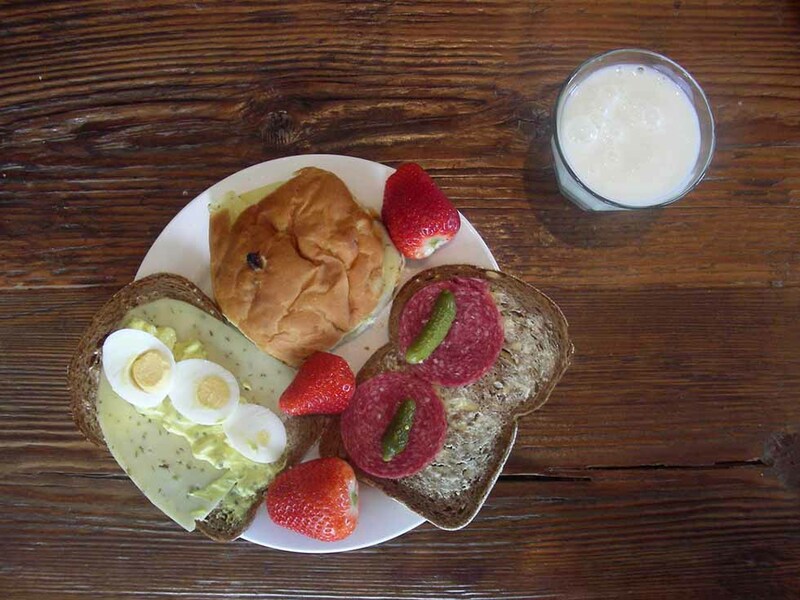 This entry was posted in Netherlands and tagged Amsterdam, Food. I am a travel loving, creative minded football freak who has a fulltime job at an IT company. In the evenings, I study Communication & Multimedia Design as well as write here at Maps 'N Bags. Driving is one of my passions, so whenever we can, Bruna and I go on a road trip around Europe to explore new places and cultures. You'll find the discoveries we made here on the blog! Follow us on this journey!